It is easy to get distracted while you train. Distractions will cause a shift in mental concentration diverting blood flow to the target muscle group. When training a particular exercise it is important to put your full attention on the movement. By focusing wholeheartedly you will have a greater neural connection of the nervous system and the muscle cells. Concentrate on forcing the muscle to respond the way you want it to. 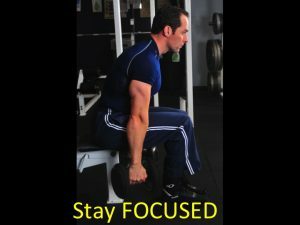 You only have a short time to initiate the neural firing of motor units to respond to a certain intensity so you must concentrate completely to reap the benefits of this before the hormones reduce and blood shunts from the target muscle. Getting constantly distracted and stopping the neural flow will dampen the neurophysiological effect. Stay FOCUSED on the task at hand and remember you only have a certain amount of time to produce an anabolic effect so don’t blow it.